Earlier this week, I was a guest on Connections, a WXXI NPR radio program hosted by my friend (and the guy who literally wrote the book on NY Finger Lakes wine) Evan Dawson. 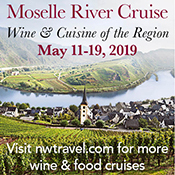 Mostly, I just tried not so sound too much like an idiot compared to the show’s (much) more eloquent host and guests (Bob Madill of Kindred Fare, and winemaker August Deimel of Keuka Springs). 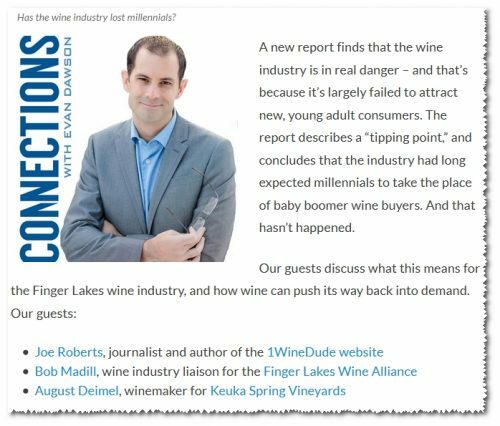 The part that was most surprising was that the show’s theme centered around the Op-Ed-style piece I penned in mid-February, in which I posited that the wine industry as a whole has fumbled the ball when it comes to attracting the Millennial generation, as evidenced by multiple reports showing that wine in the USA is hemorrhaging those younger consumers and now needs desperately to staunch the bleeding, having failed at the preventive medicine part of hopping generational buying habits. It’s not all gloom-and-doom, of course; the wine biz is very good at some forms of consumer engagement, but I maintain that those forms work best with an older crowd. Our discussion morphed from whether or not wine is losing the battle for younger drinkers, into both broader (wine biz writ-large) and more focused (impacts on the NY FLX wine scene) conversations, and now my minor dream of trying to sound intelligent during one of those super-cool, dignified NPR discussions has finally been realized. You can listen to that show here, or via the embed below (and then make fun of me in the comments). Make sure that you have NPR coffee mug in hand first (but you can, of course, fill it with wine… I’m not gonna judge…). how big is audience on NPR? Beats me. This is the Rochester affiliate so probably not enormous.